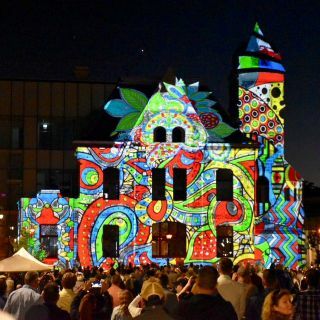 The City of Cambridge, Ontario, has brought a 20-minute projection mapping show to its downtown core, delivered by Westbury National services and Christie technology. To celebrate the reopening of the former Galt Post Office as a digital library, Westbury National was tasked with designing the projection mapping content and installation of this permanent attraction. Creating such a dramatic piece of public art is no small feat, and Coniglio knew Christie technology was up to the demands of a permanent installation. Westbury installed four Christie Boxer 2K30 projectors and a Christie Pandoras Box media server. “We’ve worked with the Boxers before. We did another permanent installation of 18 Boxers for the Colorado Avalanche, and we wanted to continue that product choice because we knew we could rely on it,” said Coniglio. Westbury also used Christie Pandoras Box with the Avalanche, and its track record of stability and ease of use was something that Westbury could depend on for this installation. Christie Pandoras Box media servers enable real-time video processing and show control, including a true 3D compositing space to align objects and plane environments for projection mapping or real-time 3D playback. Coniglio said serviceability was another key factor in their choice. “Christie provides Westbury with amazing support allowing Westbury to offer the same level of service to our clients that are purchasing high tech projects like this,” said Coniglio. “Location of the manufacturer is key. The fact that the installation is in Cambridge was an added bonus as support from Christie was only half an hour away.” Christie’s engineering and design centre is located in Kitchener, Ontario, north of Cambridge. Undertaking this project required a team effort from Westbury National, from installing the projectors, to creating the original content that’s projected during the 20 minute show. “I can’t do what I do without a great team. And that team consists of great projectionists, great content creators, and being able to deliver on-time and on-schedule,” said Coniglio. Westbury National team members included Doug Wildeboer, Guy Wallace, Kevin Mifflin, Andrew (Ziggy) Cwierdcinski, Tim Harrington, David Eva and Dean Bayley.